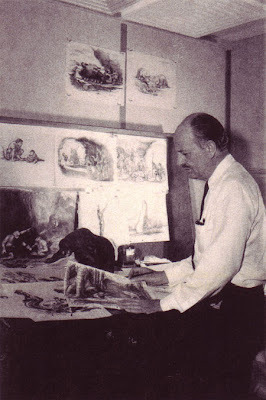 Disney legendary artist and Imagineer John Hench was hired by Disney in May 1939 to work as a sketched artist and quickly moved to background painting for Fantasia and later Dumbo. He then joined the layout team on The Three Caballeros and Fun and Fancy Free, served as art director on Make Mine Music, did color and styling for The Adventures of Ichaboad and Mr. Toad , Cinderella, Alice in Wonderland and Peter Pan, developed the cartoon art treatment for combining live action and animation in So Dear to My Heart, created animation effects for The Living Desert , lead title special effect credits for the Academy Award winning movie 20,000 Leagues Under the Sea, worked with Salvador Dali on the animated short project Destino and moved to WED (now known as Walt Disney Imagineering) in 1954. 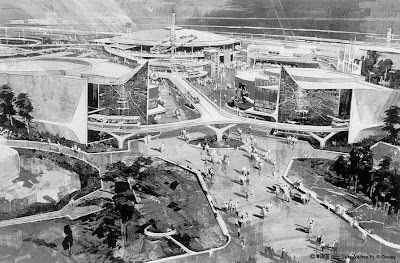 While at WED, John was first involved in the creation of Tomorrowland for Disneyland and then worked, among other projects, on the organisation of the 1960 ceremonies for the Winter Olympics, on Disney's contributions to the 1964 World Fair, and on Space Mountain. John also lead WED from 1972 to 1982 as Executive Vice President, and remained till 2004 WDI's "color guru". In June 1996, I had the pleasure of interviewing him in his office at Walt Disney Imagineering. 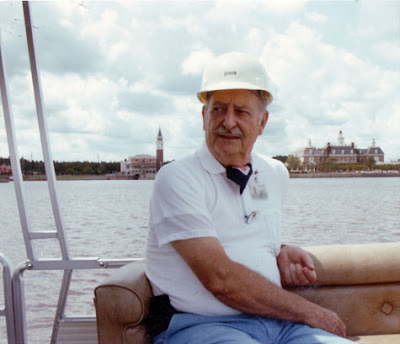 At the time of the interview, John was choosing the colors to be used for the Magic Kingdom castle during the Walt Disney World resort's 25th anniversary celebration. And now, here is the 1996 interview. ALAIN LITTAYE: How did you enter the Walt Disney Company? JOHN HENCH: Well, it happened in 1939. I have wanted to be a fine artist painter, and I reached the point in art schools were I'd like to understand more about images and how images communicate information to people. And I was not getting very far in that from my professors. So I thought that it would be easier to learn that (if) I worked in motion pictures. So I went to work with one motion picture producer who was developing a color system. This didn't do to me much good. All I did was pick (out) filters for the camera. The other (thing I tried) was working for special effects. Which was not what I was looking for. So I finally came to Disney, who was hiring people for "Fantasia." I like classical music, so I thought "This is fine." And I found what I was after, because the studio had developed a great skill in producing images that have great meaning for people. Mickey is one of the prime examples: Mickey has never been suspected of being an American export. It was déjà vu. They gave him (a) local name and he's been accepted everywhere he goes. Even in China. Children there, next to the Great Wall, who had never seen Mickey Mouse responded. So the studio did (have) that skill to communicate with images. AL: You went through a record number of different jobs while you worked at Disney. Which one did you enjoyed the most? Even the camera (department). One day, I (told) Walt : "I would like to work on camera for a while." He said "Well, really? What for?" And I explained to him that some of the scenes -- I was in background painting then -- didn't come out right. And I thought they had lit them wrong, particularly on the multiplane camera. So Walt said "Fine," and I stayed there for three years. And I (helped) develop (Disney's) special effects department at that time, (which) helped very much when we worked on "20000 Leagues under the Sea." Then I started to work on Disneyland, on the idea of a theme park. Walt said one day when he walked by my desk "I want you to work on Disneyland ... And you are going to like it!" And he kept on going. I didn't have even a chance to answer! But I did like it. Because it was much the same -- the same kind of things achieved (in) the movies (but) in another way -- three dimensional. We have the long-shot when you're coming in, then people come to the close-ups. When you're going from Main Street to Adventureland, there is a threshold. The painting is different, you get information from your feet that you are crossing something, and the music is different, etc. Walt put everything he knew about communication with images into the park, so it was very familiar. Walt had a marvelous intuition. And because he understood people very well, liked them and had great respect for people, there was nothing cynical about Walt. In other studios I worked for, they were all cynical! When they did bad pictures, they were saying: "They won't know the differences!" But it©ˆs wrong, (people) do see the difference, and it's because they have feelings. They don't see it from the intellect, but from feelings. And Walt understood all of those things, and even common things about people. For instance: Usually you get your idea of what kind of day it is by looking at the horizon, because the horizon is your (eye) level. So what Walt did is to eliminate the horizon. When you go to the park, there is no horizon -- just Disneyland. And so the environment is very special, because nothing leaks in from outside. Even the sun is brighter! You have an impression of better weather inside the park than you do outside. You know, since we're born, the first thing we fight for in life is that feeling of being alive -- and it's the last thing, too. We never want to give up that experience of being alive. And this is the secret of Disneyland: Everywhere in the park, it's like a pat in the back telling you: "You're okay. Life is good." We've achieved this feeling, for instance, with the colors. The colors in the park are harmonious with each other, not like in big cities where they don't. Big cities are chaotic. And chaos for humans -- who have experience from their ancestors -- is the last step before conflict. So, in the park, every kind of visual contradiction has been eliminated. AL: Talking about movies: You told me before that you worked on "20000 Leagues under the Sea." What kind of special effects were you involved? JH: Well, there were a lot of special effects as you know. I did what we call dry for wet effects, some of the miniatures work and two animation sequences. I even took the place of the actor who played Professor Arronax. It's the scene where Professor Arronax is sitting in his cabin, making an entry in his diary about a storm overhead on the surface, but quiet and calm where they were underneath the water. We could not find (Paul Lukas) that day. So I put on a coat and played his role. Actually, it's my hand that you see writing on the diary. Not in spencerian script, because I didn©ˆt had time to practice. You'll see it in the movie. JH: Oh, "Destino"! 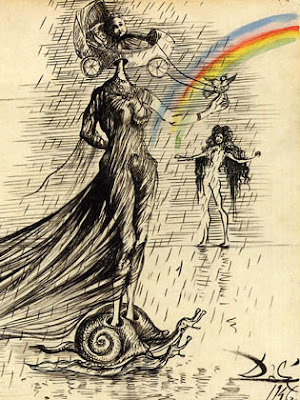 Yes, it was with Salvador Dali. The theme of "Destino" was about space, time and love. It was supposed to be 10-12 minutes long, and included (in) what they called at that time a package picture, with a number of short subjects that make all together a long feature. It was supposed to be with "Three Caballeros," "Make Mine Music," etc. But at that time, suddenly our distributor -- RKO -- didn't want any more of (these package pictures). So Walt reluctantly suspended (on the film). So there is only the story (plus) a 30 second test that I did. Because I thought that -- when Walt had (seen these) images on the screen -- he might want to go ahead with (production of the picture). 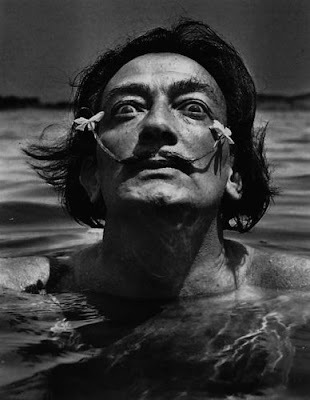 I shot a test with Dali. It was supposed to be animated, but I didn't had any animator! So we did something which was more animation effects than real animation. But the story was complete as (were) the storyboard too. And even the plans for production. Walt was sorry afterwards. He said we should have gone ahead and made it anyway. Because of the value of the document. AL: What was the origin of the project? 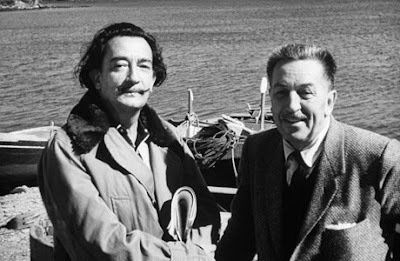 JH: Dali was working for Warner Brothers on the Hitchcock movie ("Spellbound"), and he stayed at Jack Warner's house in Beverly Hills. And Walt met him at dinner, because Jack Warner and Walt were friends. And Walt asked him if (Salvador) would like to come over and do something for us. 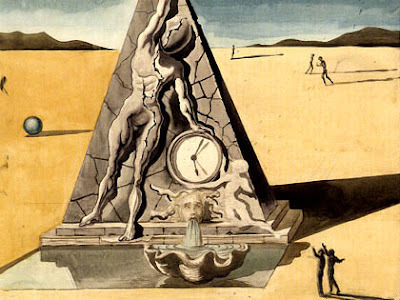 (Dali) said "Yes." And so he came at the studio. We had a piece of music, and Walt said "Why don't we make a short animated out of this?" And that's how it happened. The music was very banal, but Dali didn't mind, because he knew he could (get a) handle on anything. He could take the banality out of anything! The fact is that (Salvador) enjoyed banal things, really. He was crazy about the western pictures, the worst ones in the world. And he reinvented the whole story. From the stampede and the long horn cattle, he will tell you that -- in fact -- it was all about the libido of one of the actors! So he was never bored by anything, because he re-interpreted. One of the things he was doing was taking the dictionary and making a Dali equivalent for every word. He reinterpreted each word in a "Dalinian" manner and gave it a new meaning! This is a tremendous work! 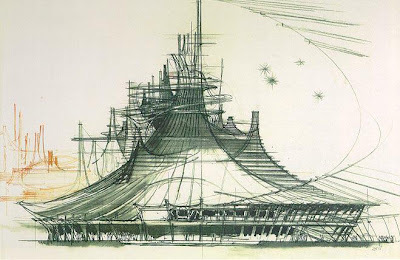 AL: Can you tell us about the Disneyland attractions projects you work on and that were never built? Some other ideas had changed from their initial concept. The "Tiki room," for instance, was supposed to be a Polynesian restaurant. I had ordered tables, I had bought all the furniture. And Walt was listening one morning to a rehearsal of the show, and he said: "If we get rid of the tables, how many more people can we get in here?" So I took the tables out, arranged the chairs in a certain way, etc. ... And he said: "That's what we gonna do. I'll handle the man who was to operate the restaurant. So we (can) make a show out of it." But, with no restaurant, you can't make a show like that. It must have an overture. And we tried to do something about that (right up) until the last minute before (the "Tiki Room" 's official) opening. In the first version, we had to pretend that he birds were asleep. Somebody came in saying "Hey, wake up, wake up!" And we started the show that way which was very bad. I was always embarrassed about this. Because you can't design a show for one operation and then make a change so radically. And not to mention this Offenbach music in the middle. Which is incredibly boring! I remember that I protested. I'm not a musician myself. But we had a big fight, the composer who did the music and me. His name was Buddy Baker. I'll never forget him! 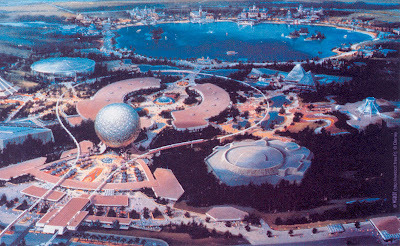 AL: Do you have memories about the original Epcot project? JH: I worked on the concept, the first layouts and designs for the property. I worked on all the attractions concept. 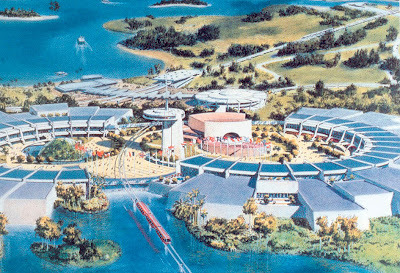 I remember that -- at the beginning -- we had two separate models for Future world and world showcase. And Marty Sklar pushed them together, and we combined them. I don't think that was too successful. Because I always thought that the two of them should have been more separate. Also I had planned the monorail station to be in the center. So that one day you would have (had to) go to World Showcase and then the other day to Future World. And I still think (that) would have been better. 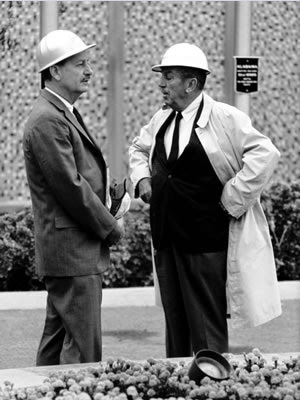 AL: What was your worst challenges on your works for Walt Disney world? JH: Well, I suppose that every time there is difficulty. 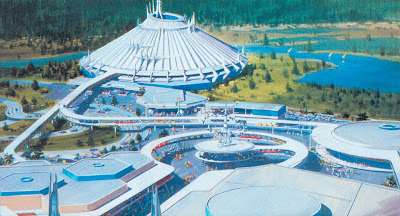 I remember about Space Mountain: It took us ten years before we found the technology that (would) allow such a ride. And during these ten years, I had a model that I kept, waiting for the technology we needed. And one day, we finally found out the technique of separating and getting information about where every train (would be) at any moment. Of course, I went over budget many times, because -- as you go along -- some things improved, and you get better ideas. And you get advantage of what is there and all that cost money. When we started a project, all my focus was on it, night and day. You never forget it until it©ˆs done. I suppose I always had a passionate relation with the projects. Because, you know, it's never a hard work when you enjoy yourself. Look, I've been here since 57 years, and I don't have to explain why I've stayed so long. I always enjoyed it. AL: I can understand that. Where else somebody can give you 100 millions dollars to build some big toys? JH: Nowhere, that's right. And no place where they believe in big toys. 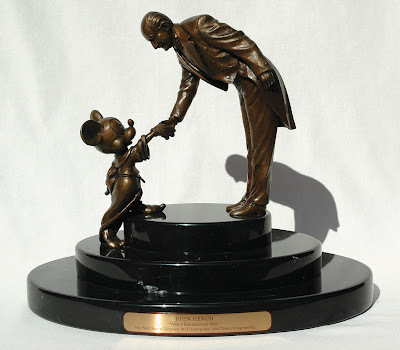 AL: What is your favorite achievement on Walt Disney World? JH: Usually, it's the last thing I've worked on. Now, I worked on colors. Color is a very critical thing. I've found that architects don't like colors. Engineers too. And so somebody has to stand in. Because this is the finish of it. It is the emotional part of a structure. I had great satisfaction in doing that. 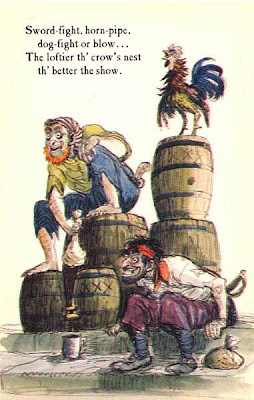 AL: Sam Mc Kim was a specialist of western theming, Marc Davis was famous for the humor he introduce in the attraction. What was your specialty? JH: Well, I suppose that I was a kind of consultant for taste. Is it good taste? Or bad taste? I had an attention to detail, to what would tell best the story. Because many people get excited about the work and drift off from the story. Like "Pirates of the Caribbean," for instance. When you get in, you see on the door: "Pirates of the Caribbean." (So you expect to see pirates. Then you get on the boat, so you think: "This is okay. We're going to see pirates." The boat goes out and the first scene that you see is the restaurant. So people think: "Hey, these are not pirates. These are people having lunch. What happen to the pirates we are supposed to see?" Then we go down the chutes , and it's where the pirates were. But they're all gone. There is nothing but skeletons down here! AL: In the Paris version, they put the skeleton at the end, not at the beginning. JH: Well, at least they've learn something! AL: Have you been to Disneyland Paris? JH: Yes, I like it. The colors I choose there was to paint the first hotel, the Disneyland Hotel. Because of the cloudy sky we had in Paris, it had to be a particular kind of color who will fight those grey days. And also something you can see when you're driving up ... "There it is! We're arriving! " And I think it works well. Better than the castle. Someday, we'll have to paint this castle all over again! AL: You knew Ray Bradbury who helped the Imagineers on the Orbitron concept. What was your relation with him? JH: Ray is a good friend. And he was a good friend of Walt, too. We worked on several things for the world's fair together, on some of the exhibitions for industrial companies, and we're still consulting him occasionally. In fact, I think the studios are working on a cartoon picture from one of his books. He has talked with Roy Disney about it. But I don't know at what point is the project. AL: What are you currently doing at WDI? JH: Well, I happen to be working on two hotels. One is being rehabbed, repainting.And the other one is a large one. 1900 rooms, themed on the Southwest of the United States. New Mexico, kind of. It's an enormous amount of work: there are 28 separate buildings, and I work on the choice of the colors for everything. Outside colors, balcony colors, etc.. And all of this has to work together, in harmony. I work also on the WDW castle. We are going to make a big cake out of it for the 25th anniversary. It's a big work. The logistic of that is just enormous. AL: What is your fondest memory of Walt? JH: I always admired his optimism. He seemed to know the direction he was going to. When I was at the studio, I remember he kept driving all of us back down to a more fundamental level all the time. When we tried to use -- let's say -- an event that was current, he said: "No, don't use that! It's all right for now. But I want these pictures to come back for years and I want them to have a meaning. If you use that now, it will be okay for today. But four or ten years from now, what will it mean?" And he was right: We still can release a 40 years old picture, and it's still good because it still has meaning. Another memory I have is when I was working on a Stravinsky animation adaptation. It was supposed to be a ballet, and I didn't like it. Walt said "Why?" And I told him that I didn't know anything about ballet. And he said "Oh....Well, here is what I want you to do." And (Walt) called the impresario of the Ballet Russes of Monte Carlo. And he arranged for me to go sit back stage for the whole season! For all the performances! And I made a thousand drawings, went back, and did my job without any complain. (Walt) often did these kinds of things. Like letting me go (to work) down (in) the camera department. Who does this now? Nobody! You have a job, and you stay on it all your life now. Nobody now is going from department to another department. Only Walt did that. AND NOW , here is a youtube video where you will see John Hench with Walt , during the Disneyland 10th anniversary tv special. Interview recorded June, 24, 1996 by Alain Littaye, with the friendly help of Didier Ghez for the questions, and previously released on the JimHillmedia web site. Great post! Love the artwork and interviews. Enjoyed this interview and all the terrific images, Alain! I am amused by John Hench's comments on the Tiki Room, regarding how he thought the new WDW show, "Tiki Room Under New Management" would be an improvement over the original. Sadly, that turned out not to be the case. Also, I have to disagree about the Offenbach number with the "Enchanted Fountain" being, in his words "boring." That has always been one of my favorite moments in the show, musically and visually. Lastly, Hench "blames" Buddy Baker for the music. 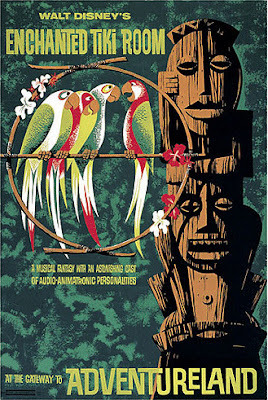 Actually, the Tiki Room's music score was arranged and conducted by the brilliant George Bruns. Sorry, Mr. Kidney, but I beg to differ. The "Under New Management" show is great, IMO, and it saved WDW's Tiki Room from getting torn out completely, so I think that someone like you should be more thankful and grateful for the fact that WDW still has a Tiki Room. Also, I thought that the Imagineers who made it (Jeff Burke, Kevin Rafferty, etc.) were your friends, so please be nicer and more respectful to them. The old show may still be popular at DL, but it lost its popularity at WDW.